Like most things in your dogs diet, everything has exceptions. Most fruits are fine, but should only be given as treats and in moderation. Remember what happens to your stomach, if you eat too much fruit? The same goes for your dog. There are a fine fruits that should never be fed to your four-legged friends. Grapes and raisins are the ones, most know about. Even a small amount can cause you dog or cat kidney failure. Signs to look for if your pet is having a reaction to eating grapes, is repeated vomiting and being lethargic. The tomato is OK for your dog, however if you like to grow your own keep them away from the plant. The plant contains solanine. This can cause, diarrhea, dilated pupils, and a slow heart rate. Seeds and pits are the biggest problem in fruit snacks for your pet. Apple seeds contain cyanide, which eaten in large amounts can be fatal. Apples slices are fine, just core and de-seed. Persimmon seeds can cause inflammation of the small intestine. Don't forget that fruit like peaches and plums have a large pit that could be a choking hazard. The avocado's fruit, seeds, leaves, and bark all contain persin. This can cause vomiting and diarrhea. One of my favorite kinds of fruit is citrus; but when it comes to sharing with my doggies, the answer is no. This is a controversial concept. For example, an orange is not toxic to your dog, however citric acid in the orange could make him/her vomit. Did you know that some natural dog foods contain citric acid as a preservative? Some studies are inclusive as to if it is harmful or not. It is believed that if you soak the citric acid preserved dog food in water and then feed it to your dog it can cause "Bloat" or Gastric Dilatation Volvulus, which is fatal to dogs. It is command not to soak it in water. So, what if your dog eats his food, then drinks water? 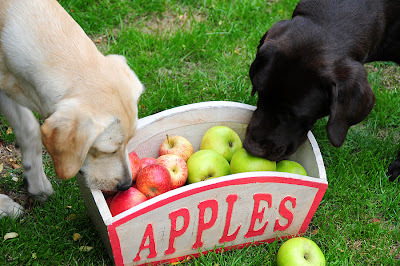 I say there are many other fruits for my fur kids to enjoy, and they don't need any citrus. If you want to introduce your dog to some fruit treats, I suggest let them taste a small piece. If they don't like it, don't force them to eat it, try something else. Once you find a fruit they are willing to try, give them a small amount and wait a day to see how they digest it. If all seems good the next day, add the fruit to their treat line-up. Watermelon is well liked around our house.